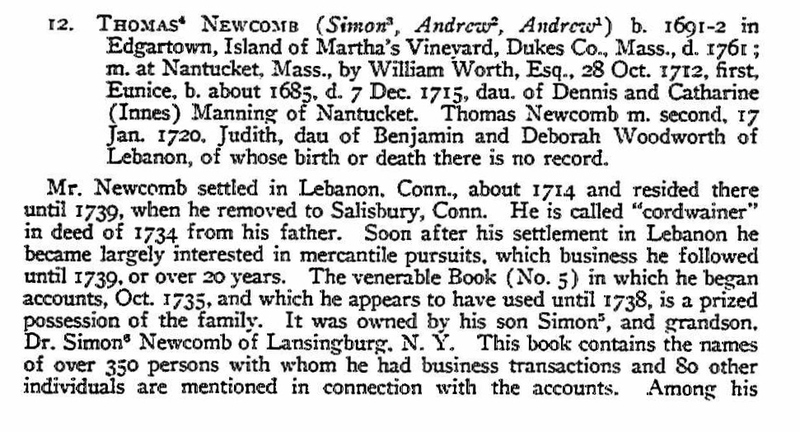 Simon NEWCOMB (1665 – 1745) was Alex’s 7th Great Grandfather; one of 256 in this generation of the Miller line. 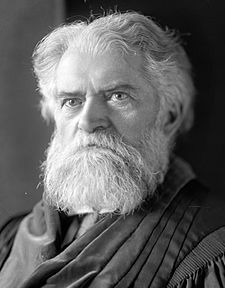 His 3rd great grandson was Simon Newcomb (wiki) (1835 – 1909), a famous Canadian-American astronomer and mathematician. 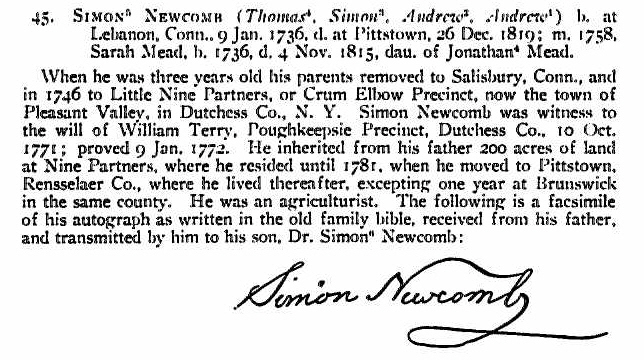 Simon Newcomb was born about 1665 in Kittery, York, Maine. His parents were Lt. Andrew NEWCOMB and Sarah YOUNG. When he was eight years old he moved with his father Andrew to Martha’s Vineyard, where he raised his children. He married Deborah LATHROP about 1687 in Martha’s Vineyard, Mass. In 1711 he made his first purchase off the Island, in Lebanon, Connecticut. and moved there permanently in 1714. 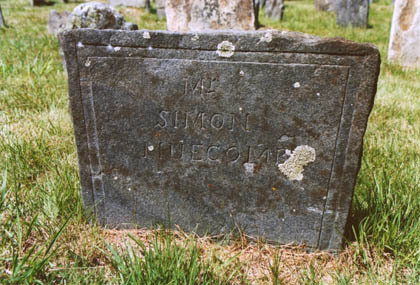 Simon died 20 Jan 1744/45 in Lebanon, New London, Connecticut. 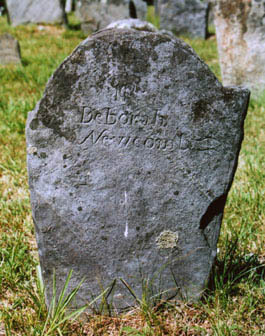 Deborah LATHROP was born about 1664 in Edgartown, Mass. Her parents may have been Samuel LATHROP and Elizabeth SCUDDER. However, many Lathrop genealogies don’t include their daughter Deborah. All of Deborah’s Lathrop siblings were born in Connecticut, while Deborah was supposed to be born in Martha’s Vineyard. Simon did have property in Lebanon, CT. Some genealogies state that her parents were Samuel William Buell and Deborah Griswold. However, their Deborah Beuell married Nathaniel Porter in 1710 in Killingworth, CT. Our Deborah died on 17 Jul 1756 in Lebanon, CT.
Deborah Newcomb Headstone Here lies ye body of Mrs Deborah Newcomb Wife of Simon Newcomb She was a pious virtuous woman & Died in hope of Eternal life thro ye mercy of ye Lord Jesus June ye 17 1756 in the 92 year of her age. 28 Oct 1712 Nantucket, Mass. A number of websites state that Simon and his brother Simeon (1662-1711) are the same person. This leads to a lot of confusion, especially since Simeon’s name was sometimes written as Simon. From B.M. Newcomb’s 1923 book. 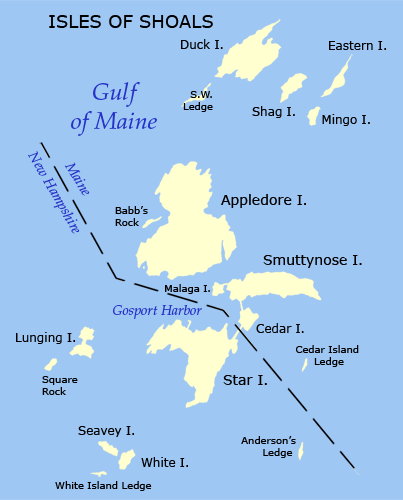 It is possible that at the time of his birth his parents were residing upon one of the islands of the group called “Isles of the Shoals”, situated in the ocean, a few miles from Kittery and Portsmouth. It appears that the first four years of his life were spent on what was then called Hog Island or Appledore, the most picturesque of the “Shoals”. The next four years were spent on the mainland, in the village of Kittery. Soon after he was eight years old the family removed to Edgartown, on the island of Martha’s Vineyard, Dukes Co., Mass., where they remained until the autumn of 1713, when his father established the family at Lebanon, New London Co., Conn.
13 Mar 1693/94 – He bought of Thomas Wallen, for £10, Meadow at Manado, by the beach, one share called the Purchase, 10 acres upland a half-mile from the harbor, adjoining Mill Path, and half of Common, on Martha’s Vineyard. As one of the proprietors of lands in Edgartown, Mr. Newcomb received several shares, the first in 1695. 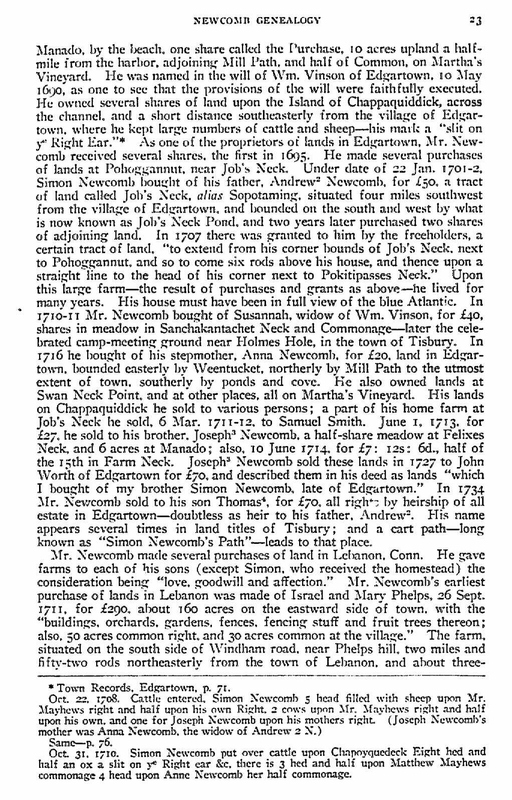 22 Jan 1701/02 – Simon Newcomb bought of his father, Andrew Newcomb, for £50, a tract of land called Job’s Neck Pond, alias Sopotaming, situated four miles southwest from the village of Edgartown, and bounded on the south and west by what is now known as Job’s Neck Pond, and two years later purchased two shares of adjoining land. In 1707 there was granted to him by the freeholders, a certain tract of land, “to extend from his corner bounds of Job’s Neck, next to Pohoggannut, and so to come six rods above his house, and thence upon a straight line to the head of his corner next to Pokitipasses Neck.” Upon this large farm – the result of purchases and grants as above – he lived for many years. His house must have been in full view of the blue Atlantic. 1710/11 – Mr. Newcomb bought of Susannah, widow of William Vinson, for £40, shares in meadow in Sanchakantachet Neck and Commonage – later the celebrated camp-meeting ground near Holmes Hole, in the town of Tisbury. 6 Mar 1711-12 – He sold a part of his home farm at Job’s Neck to Samuel Smith. 1 Jun 1713 – He sold to his brother, Joseph Newcomb, a half-share meadow at Felixes Neck, and 6 acres at Manado for £27. 10 Jun 1714, for £7: 12s: 6d., half of the 15th in Farm Neck. 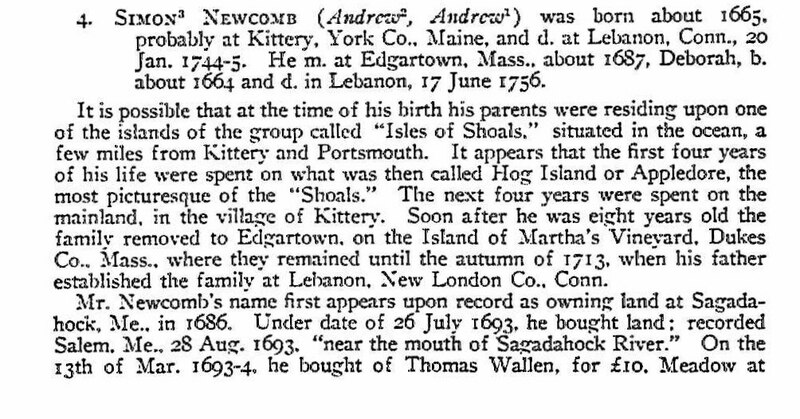 1734 – Mr. Newcomb sold his son Thomas, for £70, all rights by heirship of all estate in Edgartown – doubtless as heir to his father, Andrew. His name appears several times in land titles of Tisbury; and a cart path – long known as “Simon Newcomb’s Path” – leads to that place. Mr. Newcomb lived upon this farm, one of the very best in the locality, until his death, when it went by will to his son Simon, by whom it was conveyed in 1761 to Silas Sprague for £750, by whom it was sold the following year to Jabez Dean, of Norwich. 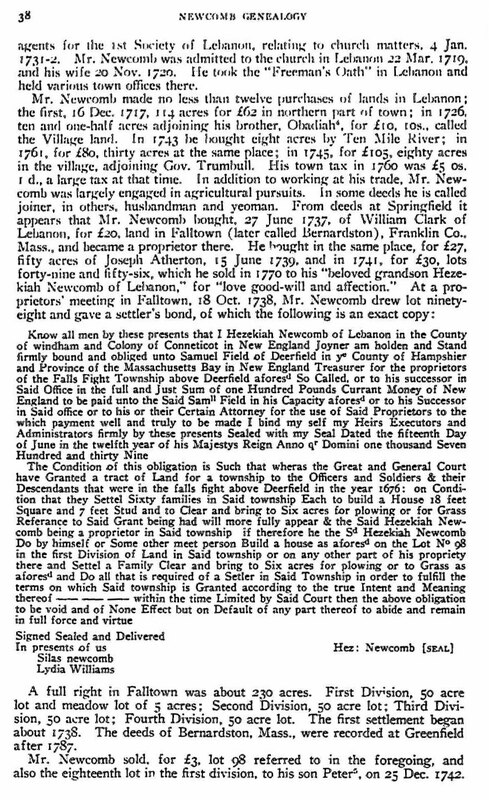 Mr. Dean sold it, 1773, by one deed, the purchasers being Daniel and Joshua Lothrop, of Norwich; and Nathaniel Greene, Jonathan Simpson, Esq., John Hancock, Esq. (first president of Continental Congress), and Ebenezer Storer, all of Boston, Mass. The farm was later owned and occupied in part by Asa N. Burgess and F.H. Simpson. 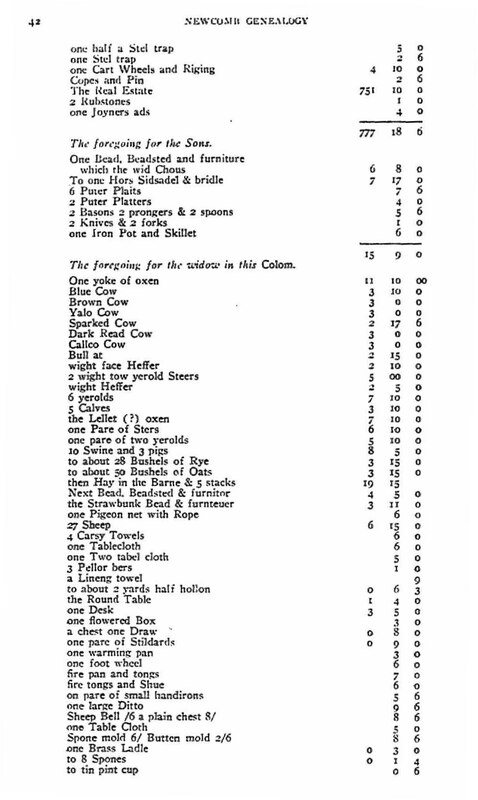 Mr. Newcomb served as a member of various committees in town affairs; in May 1693 had “full power and order for the ordering of the sheep & cattle”; signed a venire as Constable of Chelmark, 1699 (according to Court Record); was chosen to settle bounds of lands in 1704; viewed lands to find Thomas Peas’ dividend on 28 Jan 1705; found records of town’s bounds 5 Mar. 1705/06; in 1710 he was chosen by his townsmen as “Field Driver” at Edgartown. Simon Newcomb took the Freeman’s Oath at Lebanon and was elected highway surveyor in 1714. On 15 Sept. of the same year he was one of a “Comity” of three for building “meetin” house in Hebron, and reported, 5 Oct. following, a proper site for same. In 1718 he was chosen grand juryman; in 1721 he was appointed guardian to Caleb Jones and in 1741 was chosen fence viewer. 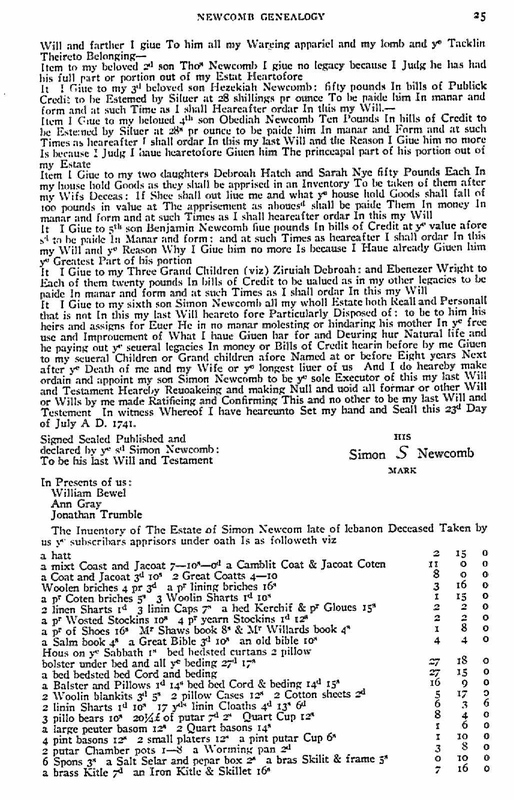 The following is a copy, verbatim et literatim., of the Will and Inventory of Simon Newcomb, from Windham Probate Records, Vol. 3, pages 169 to 172. In the Name of God amen I Simon Newcom of lebanon In ye County of Wendham and Coloney of Connecticut In New England being In Good state of bodyly health and of sound and Disposeing memory for wch I bles God: but caling To mind my own mortality and that It Is appointed for all men once to Dye Do make and ordain this my last Will and Testament Princapaly and first of all I Recomend my Soul to God: The Giuer Theireof and my body To The Earth To be beuried In Decent Christian burial at ye Descretion of my Executor Herein Namd: Nothing Doubting but that I Shall Receive ye same again at ye General Resurrection Through ye power of almighty God From whome I lok for Redemption and Saluation Through The lord Jesus Christ and Now as toye Wordly Goods and Estate Wherewith It hath pleased God to bles me in this life. It I Glue to my sixth son Simon Newcomb all my wholl Estate both Reall and Personall that is not In this my last Will heareto fore Particularly Disposed of: to be to him his heirs and assigns for Euer He in no manar molesting or hindaring his mother In ye free use and Improuement of What I haue Giuen har for and Deuring hur Natural life and he paying out ye seueral legacies In money or Bills of Credit hearin before by me Giuen to my seueral Children or Grand children afore Named at or before Eight years Next after ye Death of me and my Wife or ye longest liuer of us. And I do heareby make ordain and appoint my son Simon Newcomb to be ye sole Executor of this my last Will and Testament Heareby Reuoakeing and making Null and uoid all formar or other Will or Wills by me made Ratifieing and Confirming This and no other to be my last Will and Testement In witness Whereof I have heareunto Set my hand and Seall this 23d Day of July A D. 1741. 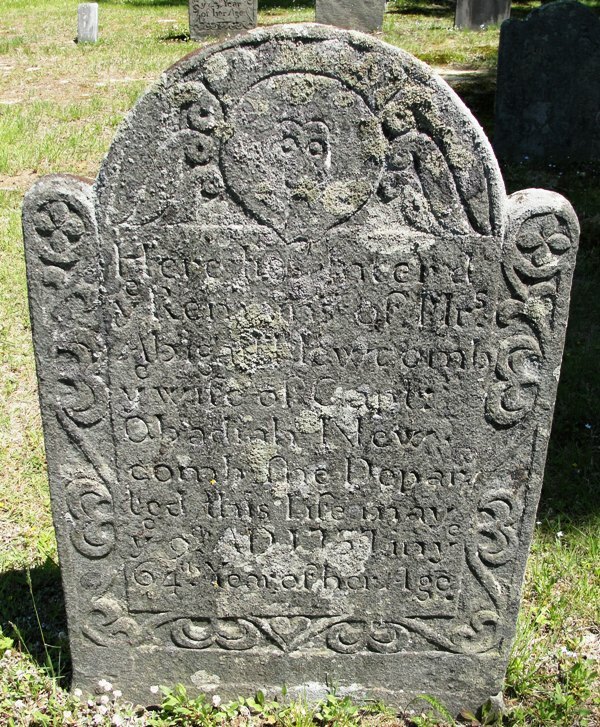 John was born in Edgartown, Martha’s Vineyard and removed to Lebanon CT where he was admitted to the First Church March 20 1715, and his wife June 8, 1718. They settled in the north part of town called the “Crank”, “Second Society”, or “North Society”, which in 1804 was set off from Lebanon as a town under the name of Columbia. Upon the organization of the Second Society, 1718, he joined it and became first deacon, an office which he held 42 years,until his removal to Cornwallis, Nova Scotia, in 1760. He took the “Freeman’s Oath” in Lebanon, date not given; was elected surveyor of highways 1725, and selectman 1744. 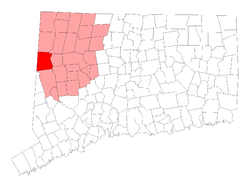 The township of Cornwallis, Kings County in a valley 40 miles by 10 miles, containing roughly 10,000 acres, was granted to the proprietors, chiefly from Connecticut, during the last years of the reign of King George II and five or six years after the expulsion of the Acadians. Deacon John and his three sons Eddy, Jonathan and John Jr. came to Cornwallis, as did a brother Benjamin, his son William and his youngest brother Simon. Cornwallis Township was one of the original townships of Kings County, Nova Scotia. The township was named after Edward Cornwallis, the founder of Halifax, Nova Scotia. It bordered Aylesford Township to the west and Horton Township to the south. While the name has fallen into disuse on maps, many historical places and documents refer to Cornwallis. The Parish of Cornwallis, however, is still in use today after more than 250 years. After the French colonists, the Acadians were commanded to leave Nova Scotia in the Great Expulsion, the area was relatively desolate. The Township was established by a group historians refer to as the New England Planters. In the early 1760s the Planters brought with them the colonial pattern of land division; each town or township was to contain one hundred thousand acres. A generation after the Planters, a sudden influx of United Empire Loyalist settlers arrived to escape the Revolutionary War in New England. Towns such as Kentville, Kingsport and Canning took shape. The New England Planters who settled in Nova Scotia during the early 1760s brought with them their familiar pattern of land division, the town or township, which also became the unit of local government. In general, the surveys for each township were made with precision, and reliable maps were drawn. Unfortunately, the original map or plan for Cornwallis Township has disappeared. There is a tradition that it was lost in a house fire, from which records of the Registry of Deeds were, happily, rescued. These books are kept today in the registry office at Kentville, along with subsequent deed volumes and later maps of the country. Cornwallis Township, like Horton Township from which it is separated mainly by the Cornwallis River (Habitant River on early documents), was to contain one hundred thousand acres. Cornwallis was assigned one hundred and fifty settlers, Horton two hundred, reflecting the importance given to the visible Grand Pre dyke. Only later did the Horton grantees realize that Cornwallis had practically as much dyke land, more widely distributed and thus more accessible. A feeling of deception is said to have remained in Horton for many years. Beginning at the mouth of the Cornwallis River, following the river to Kentville, then south-westerly in a line parallel to the Horton-Falmouth line to the Aylesford Township border, thence northerly to the Bay of Fundy, then east and south by the Bay of Fundy and Minas Basin to the place of beginning, Cornwallis Township indeed possessed many advantages. Divided among one hundred and fifty individuals, each proprietor was thus given the theoretical allowance of six hundred and sixty-six and two-thirds acres. The general survey is said to have begun in 1759. Louisburg had been captured the year before; Quebec and Montreal were still in French hands; hostile Indians and French were a very real threat; and so, protection of the new settlers was essential. The typical township was composed of a compact town site that could be easily defended, with ten-acre lots nearby for food production, farm lots slightly removed, remote wood lots, a common field for pasture of milk cows, a parade ground, and land allotted for a church and school. The actual allocations were made by drawing lots, with three men as supervisors: Captain Eliakim Tupper Jr., Captain Stephen West and Captain John Newcomb. Each of these three received a share and a half, perhaps because of the added responsibility. Naturally, a few of the farm lots which were found to have wet or poor land and were thus not attractive were rejected, so that additional lots were laid off beyond the boundaries of the original divisions, notably at the west ends of Belcher Street and Church Street, and between Kingsport and Pereau. Since the drawing of lots took place in 1761, when the Seven Years’ War was coming to a close, there was no longer so great a need for elaborate protection for the settlements. As a result, the ten-acre plots and the half-acre town lots were rapidly consolidated into holdings of more appropriate size, while many settlers proceeded to establish themselves on their 44-acre farm lots. Land between Canning and Sheffield Mills, originally designated as woodland, was recognized as desirable for clearing, as was land west of Kentville, west of Centreville and between Kingsport and Pereau. It will be seen from the attached list of grants that only 125 of the intended 150 farm lots in the fifteen divisions were taken up by the original grantees, while 140 names appear on the assessment roll for 1765. Of these 125 occupied lots, four were not taxable and were therefore omitted from the assessment roll: the glebe, the first minister’s lot, the school and the common. The remaining 19 persons were assigned land in areas previously intended as woodlots. i. Catherine Newcomb b. 21 May 1710 Lebanon, New London, CT; d. 20 Sep 1762 Mansfield, Tolland, CT; m. 1728 in Lebanon Noah Webster (b. 9 Aug 1706 in Lebanon, New London, CT – d. 20 Sep 1762 in Mansfield) His parents were George Webster and [__?__]. Catherine and Noah had twelve children born between 1729 and 1757 in Lebanon. The “Father of American Scholarship and Education” Noah Webster was born in Hartford C 1758, just a year after our Catherine and Noah’s Noah Jr (1757-1762) They were third cousins, sharing common 2nd great grandparents John Webster (1590-1661) and Agnes Smith. ii. Alice Newcomb b. 24 Mar 1712 Lebanon, New London, CT; d. 17 Jun 1752 Lebanon; m. 1733 in Lebanon to Jonathan Marsh (b. 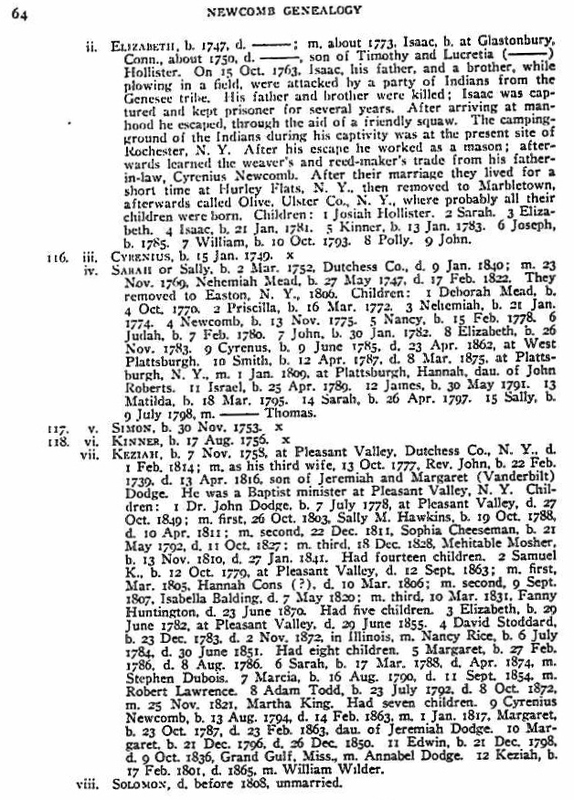 23 Sep 1713 in Lebanon – d. 1760 in CT) Jonathan’s parents were Joseph Marsh and Hannah [__?__]. Alice and Jonathan had ten children between 1735 and 1750 in Lebanon. After Alice died, Jonathan married the widow of Keziah Phelps. iii. Eddy Newcomb b. 23 Sep 1713 Edgartown, Dukes, Mass. ; d. 19 Oct 1781 Cornwallis, Kings, Nova Scotia; m. 1741 in Lebanon, New London, CT to Abigail English (b. 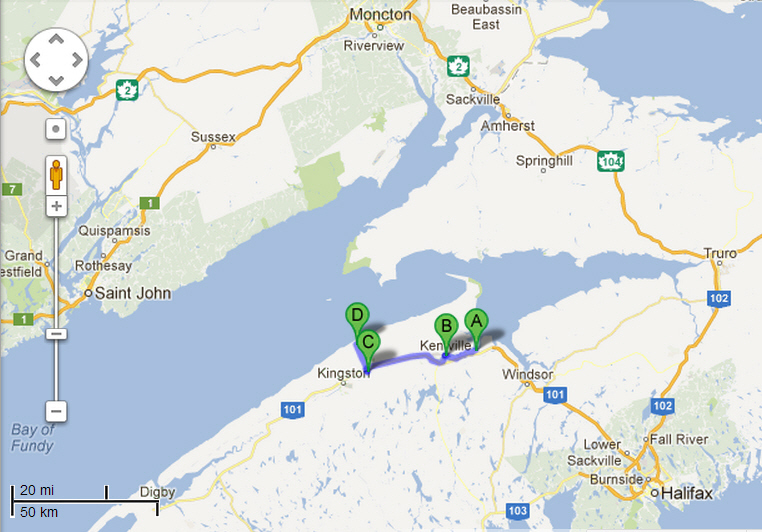 12 Nov 1724 in Lebanon – d. 1790 in Cornwallis, Kings, Nova Scotia) Eddy’s sister Abigail married Abigail’s brother John. Their parents were Richard English and Mary Hinksman. Eddy and Abigail had nine children born between 1742 to 1768; the first six in Lebanon and the last three in Cornwalis. After his marriage Eddy removed to Falltown, now Bernardston, Franklin Mass., where, on Feb 2 1742, he “for £63, bot of Aaron Denior, of Deerfield 1 share house lot No. 32 containing 50 acres; also meadow lot No. 69 containing 6 acres; also 1 full share in all the undivided land in said Township.” Also in 1742, Mr. Newcomb was moderator of proprietors’ meeting in Falltown. In 1741 his minister’s tax was 1. 6s. 3d. On account of the hostility of the Indians he was compelled to leave the country, and returned to Lebanon, where he bought several tracts of land, 1744-1750, near the present village of Columbia. He served as captain under Cornwallis in the War of the Revolution; was taken prisoner with him and his army, Oct 19 1781. British General Charles Cornwallis surrendered his army of some 8,000 men to General George Washington at Yorktown, giving up any chance of winning the Revolutionary War. The British had asked for the traditional Honors of War (marching out with dignity, flags waving, muskets shouldered, and playing an enemy [American] tune as a tribute to the victors), but remembering that the British, on taking Charleston earlier in the war, had refused the Americans (under Benjamin Lincoln) the same privilege, Washington firmly denied their request. Consequently, the British and Hessian troops marched with flags furled, muskets reversed in shame, while according to legend the British drummers and fifers played the tune “The World Turn’d Upside Down” – actually a popular British marching tune of the time, and in line with custom, but curiously appropriate under the circumstances. vi. John Newcomb Jr. b. 23 Oct 1720 in Lebanon, New London, CT; d. 13 Apr 1778 in Cornwallis, Nova Scotia; m1. 15 Jul 1747 Plymouth, Plymouth, Mass. to Mercy Barnaby (b. 1730 in Provincetown, Barnstable, Mass. – d. 27 Mar 1776 in Cornwallis, Kings, Nova Scotia); Mercy’s parents were Timothy Barnaby and Martha [__?__]. John and Mercy had eleven children born between 1751 and 1776.
m2. 13 Feb 1777 Cornwallis, Nova Scotia. to his first cousin and our ancestor Deborah NEWCOMB. Deborah first married 22 May 1766 in Kings County, Nova Scotia. to Isaac MILLER. 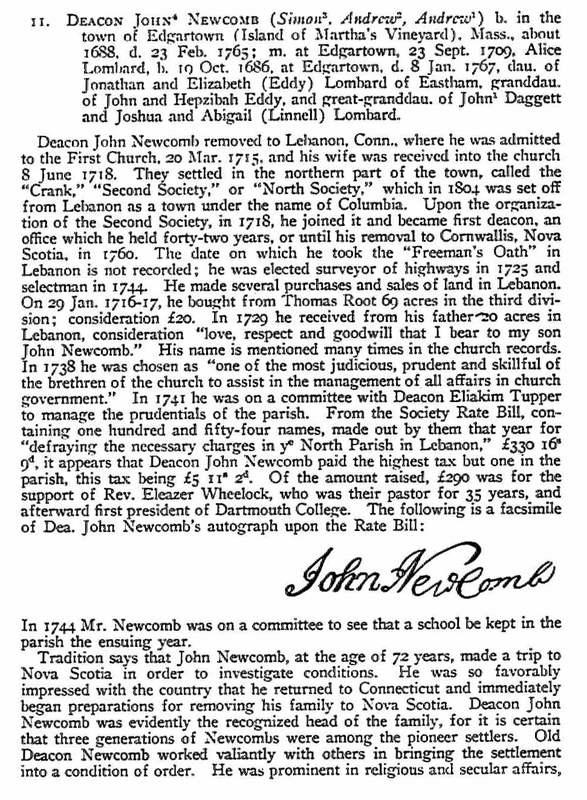 Mar 10, 1760, he and his father and their wives sold their lands in Lebanon for £550, and removed to Cornwallis, Nova Scotia, where they arrived before Oct 12, 1760. He was one of the original grantees of the township of Cornwallis, 1761, and received several lots of land there. He appears to have been a leading man among the first settlers. It is said he had 21 children; a part dying young, their names not preserved. The farm, in east Cornwallis, upon which he lived and died (and upon which his father, Deacon John, died) was left to his son John, his son’s son John, and is now  owned and occupied by his great grandson, Elder John Samuel Newcomb, who has a son named John Stewart Newcomb..
John Newcomb settled in Lebanon upon a farm adjoining his father’s. From his father he received by gift “for love and affection” in 1745, fifty acres; this farm was enlarged by several purchases. His town tax in 1760 was £5.1s.8d., a large tax at that period. 10 Mar. 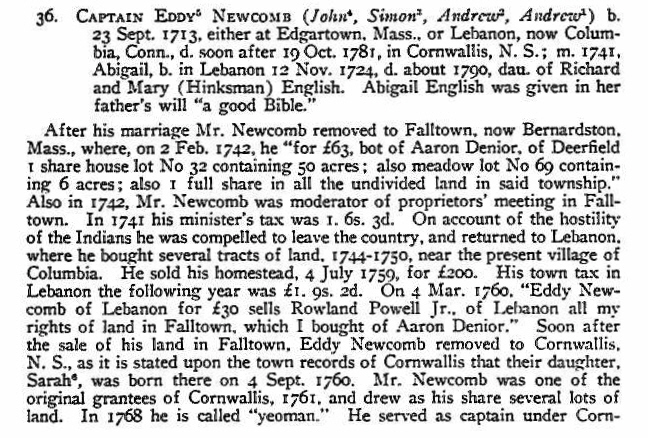 1760, he and his father and their wives sold their lands in Lebanon for £550, and removed to Cornwallis, N.S., where they arrived before 12 Oct. 1760. He was one of the original grantees of the township of Cornwallis, 1761. He received a one-half acre lot in the compact part of town by reason of the birth of his daughter, Martha, 12 Oct. 1760. He also received a five-acre lot, letter F, No. 5; six acres Dyke lot No. 18; sixty-six acres arm lot No. 1, 6th Division, draughted by his uncle, Benjamin Newcomb. He appears to have been a leading man among the first settlers. He is said to have had twenty-one children, a part dying young, their names not preserved. The first four children were born in Lebanon, Conn. The farm, in East Cornwallis, upon which John Newcomb lived and died (and upon which his father, Dea. John died) was left to his son John, his son’s son John, and was later owned and occupied by he great-grandson, Elder John Samuel Newcomb, who had a son named John Stewart Newcomb. vii. Jonathan Newcomb b. 21 Aug 1722 Lebanon, New London, CT; d. 16 May 1765 Cornwallis, Kings, Nova Scotia; m. 9 Nov 1746 in Lebanon to Deborah Tupper (b. 24 Mar 1728 in Sandwich, Barnstable, Mass = d. 1794 in Kings, Nova Scotia) Deborah’s parents were Eliakim Tupper and Joanna Fish. Jonathan and Deborah had five children born between 1750 and 1758.
viii. Jacob Newcomb b. 10 Oct 1724 Lebanon, New London, CT; d. 1777 New York; 1748 in Lebanon to Elizabeth Hamilton (b. 1724 in Lebanon – d. 1796 in Thetford, Orange, Vermont) Jacob and Elizabeth had seven children born between 1749 and 1764. Jacob joined the patriot army and died in the service at the age of 53. The cause of his death was apparent drowning while crossing Lake Champlain. His son Bethuel, after leaving the service, went in pursuit of his father Jacob; traced him to Lake Champlain, but was unable to find further positive intelligence of him; learned that he, sick of camp disease, and two other soldiers, attempted to cross the lake in an open boat; nothing further could be ascertained. Jacob Newcomb settled at Lebanon on a farm adjoining his father’s on the southwest. In addition to several purchases of lands, he received fifty acres in Lebanon as a gift from his father, for “love, good will and affection”. In 1760 he sold the most of his lands, possibly intending to settle in Cornwallis, N.S., where his parents, two brothers and their families removed that year; apparently, however, he remained in Lebanon. His town tax in 1760 was 1 5s 2d. He was a farmer. When his, son Bethuel, moved to Thetford, Vt., Elizabeth, widow, accompanied him, riding behind him on horseback. She died at Thetford, at the home of her son Israel. Thomas’ first wife Eunice Manning was born 1685 in Nantucket, Nantucket, Mass. Her parents were Dennis Manning and Catherine Innes. Eunice died 7 Dec 1715 in Lebanon, New London, CT.
Thomas’ second wife Judith Woodworth was born in 1701 in Scituate, Plymouth, Mass. Her parents were Benjamin Woodworth and Hannah Damon. Judith died in 1720 in Lebanan, New Hampshire. Soon after his settlement in Lebanon he became largely interested in mercantile pursuits, which business he followed until 1739, or over 20 years. The venerable book (No. 5) in which he began accounts, Oct.1735, and which he appears to have used until 1738, is a prized possession of the family. This book contains the names over over 350 persons with whom he had business transactions and 80 other individuals are mentioned in connection with the accounts. Among his patrons were his father, Simon, and brothers, John, Hezekiah, Obadiah, and Benjamin. His customers were were from Colchester, Coventry, Crank Society (a part of Lebanon), Goshen, Hebron, Mansfield, Scotland, Stafford and Windham. He purchased some of his merchandise at Norwich, Conn. Mr. Newcomb appears to have kept for sale everything wanted by his customers, dry goods, groceries, shoes, “Rhum”, etc. Mr. Newcomb was constable from 1721-24. In 1727 he was Quartermaster of a regiment in Windham Co., Conn. The next year he was confirmed Quartermaster. Oct. 1736 he was Lieutenant of troop in Windham Co., Conn. In 1737, he gave Hannah Harsel credit, 11s, 8d. for schooling his children. 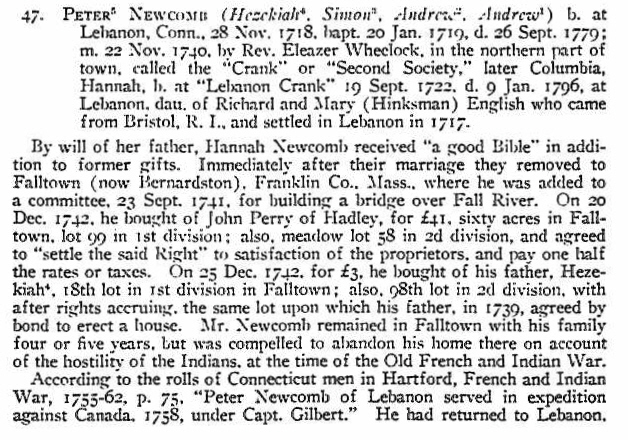 Mr. Newcomb was elected surveyor of highways, 8 Dec. 1729, and lived in Lebanon as late as 19 Mar 1738/39, but removed to Salisbury, Conn. before 11 Oct. following, and became one of the origianl proprietors of the town. He was moderator of the town meeting, 9 Nov. 1741, and the first chosen selectman. i. Cyrenius Newcomb b. 16 Apr 1721 in Lebanon, New London, CT; d. 1760 Oswego, Oswego, New York; m. 1744 in Salisbury, Litchfield, CT to Sarah Smith (b. 15 Jul 1723 in East Haddam, Middlesex, CT – d. 1793) Sarah’s parents were John Smith and Elizabeth Kennard. Cyrenius and Sarah had eight children born between 1747 and 1758. He served as an officer in the French and Indian War, and died while in service. In Muster Roll for Dutchess Co., N.Y., 1 May 1760, the following is stated concerning him: “Age 39, born in Conn., laborer, 5 ft. 5 in, brown hair fresh complexion, enlisted Apr. 8. Capt. Peter Harris Co.” His name is among those on the list of deceased soldiers, 1756 to 1762, whose heirs received the pay due them at the time of their deaths. ii. Azariah Newcomb b. 18 May 1722 in Lebanon, New London, CT; d. 29 Dec 1784 Poughkeepsie, Dutchess, New York; m. 4 May 1743 in Salisbury, Litchfield, CT to Deborah Buell (b. 18 Apr 1726 in Killingworth, Middlesex, CT – d. 29 Dec 1784 in Salisbury) Deborah’s parents were Nathaniel Buell and Deborah Horton. Azariah and Deborah had eight children born between 1744 and 1762. 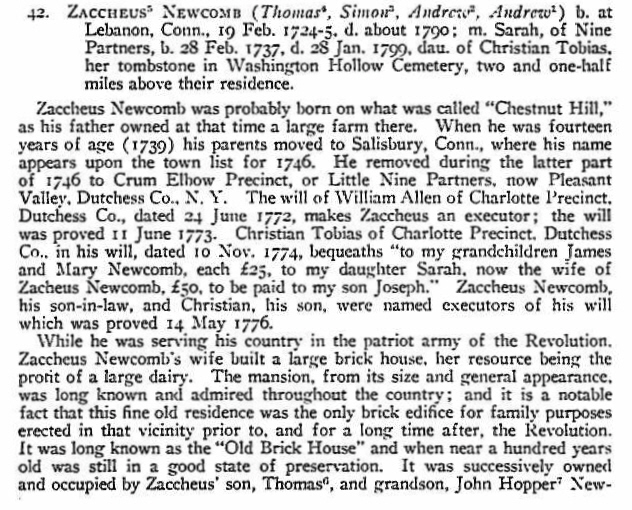 Zaccheus Newcomb was probably born on what was called “Chestnut Hill”, as his father owned at that time a large farm there. When he was fourteen year of age (1739) his parents moved to Salisbury, Conn., where his name appears upon the town list for 1746. He removed during the latter part of 1746 to Crum Elbow Precinct, or Little Nine Partners, now Pleasant Valley. The will of William Allen of Charlotte Precinct, Dutchess Co., dated 24 Jun 1772, make Zaccheus an executor; the will was proved 11 Jun 1773. While he was serving his country in the patriot army of the Revolution, Zaccheus Newcomb’s wife built a large brick house, her resource being the profit of a large dairy. The mansion, from its size and general appearance, was long known and admired throughout the country; and it is a notable fact that this fine old residence was the only brick edifice for family purposes erected in that vicinity prior to, and for a long time after, the Revolution. It was long known as the “Old Brick house”, and when near a hundred years old was still in a good state of preservation. It was successively owned and occupied by Zaccheus’s son, Thomas, and grandson, John Hopper Newcomb. It was sold by the latter, in 1859, to James Allen, and was afterwards owned and occupied by Anthony Briggs. Mr. Newcomb was commissioned, 7 Oct. 1783, as one of the assistant-justices of the inferior court of common pleas for the county of Dutchess. Jan 26, 1787, certificate of location was granted him and others of Vancour’s Island, in Lake Champlain, 700 acres. On 23 Mar. 1787, he bought township 39 in Totten and Crossfield’s Purchase, selling same 1 Dec. 1789. Mr. Newcomb was a farmer and miller. v. Thomas Newcomb b. 11 Nov 1730 in Lebanon, New London, CT; d. Dutchess, New York; m. 2 Jun 1754 in Exeter, Rhode Island to Bridget Gardner (b. 21 Aug 1734 in Exeter,) Bridget’s parents were Isaac Gardiner and Elizabeth Davis. Thomas and Bridget had five children born between 1755 and 1767 in Dutchess, NY. The Livingston family of New York is a prominent family which migrated from Scotland to the Dutch Republic to the Province of New York in the 17th century. Descended from William, 4th Lord Livingston, its members included signers of the United States Declaration of Independence (Philip Livingston – James’ cousin) and the United States Constitution (William Livingston – Philip’s son). Several members were Lords of Livingston Manor and Clermont Manor in 18th century eastern New York. James Livingston came to Poughkeepsie to live about the time of his marriage in 1751, and in 1753 bought a plot of land and built his home where he lived the rest of his life. This plot of one hundred and fifteen acres lay between the King’s Highway (now the Post Road from New York to Albany) and the Hudson River, and extended from the land owned by his brother, Henry Livingston, who had come to Poughkeepsie several years before, north to the road which is now Pine Street, Poughkeepsie. This tract now contains many streets and homes as well as the grounds of Vassar Brothers Hospital, Eastman Terrace, Eastman Park and the former location for many years of the Riverview Military Academy. During the Revolution a Continental shipyard occupied a part of the shore line, where two large frigates, the Congress and the Montgomery, as well as other naval vessels, were built. In later years the cove where the shipyard was located has been practically filled in and is now the site of the DeLaval Separator Company. A point of land extending into the river is still known as Shipyard Point. The James Livingston residence stood on a knoll not far from the entrance to Eastman Park. James Livingston was a captain in the Provincial Militia from 1760; was sheriff of Dutchess County 1761-1768; was a member of the Provincial Congress, 1776-1777, and served as chairman of the Committee of Safety in 1778. He died in 1790, aged 62 years. vii. Simon Newcomb b. 9 Jan 1736 in Lebanon, New London, CT; d. 26 Dec 1819 Pittstown, Rensselaer,New York; m. 1758 in Dutchess, New York to Sarah Mead (b. 6 May 1731 in Greenwich, Fairfield, CT – d. 1815 in Greenwich, Fairfield, CT) Sarah’s parents were Jonathan Mead and Esther Butler. Simon and Sarah had six children born between 1759 and 1779. 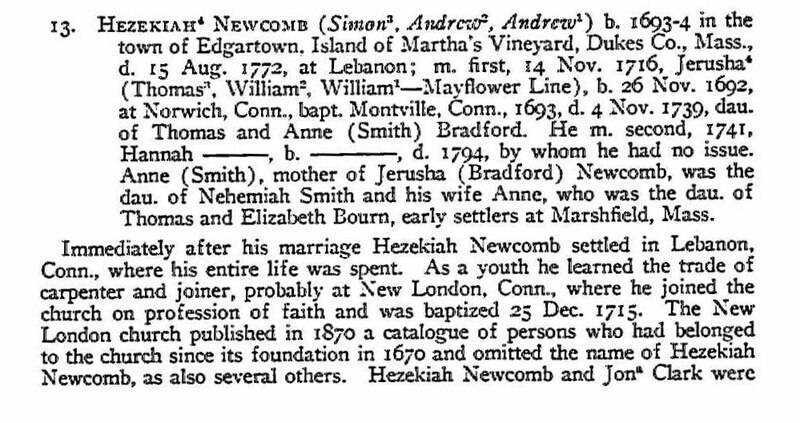 Hezekiah’s first wife Jerusha Bradford was born 26 Nov 1692 in Norwich, CT. Her parents were Thomas Bradford (1658 – 1731) and Anne Raymond (1664 – 1705). Her grandparents were Maj. William Bradford (1624 – 1703) and Alice Richards (1629 – 1671) and her great grandparents were Alice Carpenter-Southworth Bradford (1590 – 1670). and William Bradford (1590 – 1657) who arrived on the Mayflower in 1620, and was Governor of the Plymouth Colony for many years. Alice’s parents were ancestor Alexander CARPENTER and Priscilla DILLEN. For the Bradfords’ story, see Carpenter’s page. 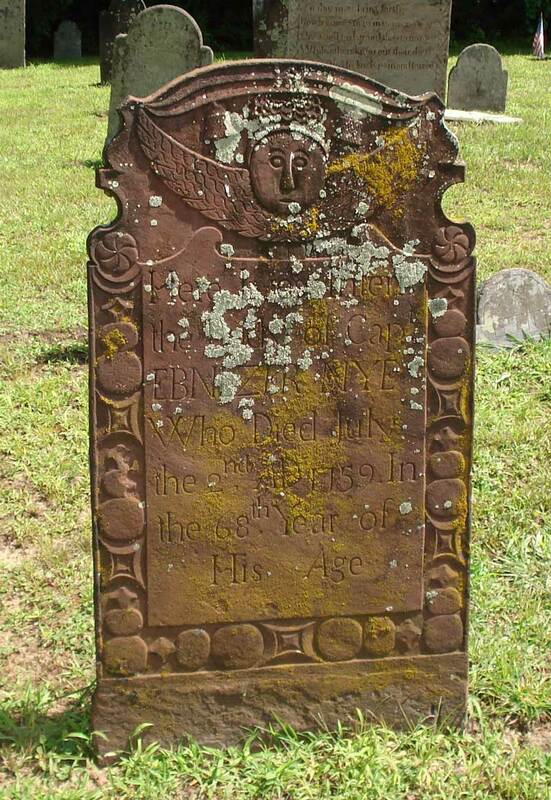 Jerusha died 15 Aug 1772 in Lebanon, CT.
Jerusha’s maternal grandparents were Deacon Joshua Raymond (1639-1676) and Elizabeth Smith (1641-1712) Her great grandparents were our ancestors Nehemiah SMITH and Sarah Ann BOURNE. Hezekiah settled in Lebanon, Conneticut, shortly after his marriage to Jerusha Bradford 14 Nov 1716. Occupation: Carpenter / joiner. i. Silas Newcomb b. 2 Sep 1717 Lebanon, New London, CT; d. 24 May 1773 Lebanon; m. 5 Mar 1739 in Lebanon to Submit Pineo (b. 19 Oct 1717 in “Lebanon Crank” now called Columbia, CT- d. 12 Feb 1804 in Lebanon) . Submit’s parents were Jacques “James” Pineo and Dorothy Babcock. Silas and Submit had ten children born between 1741 and 1762. Wife, Submit, lived with Silas’ parents 3 years before they were married. In 1741 they moved to Falltown, MA (now Leyden, Franklin, Mass) They were forced to return to Lebanon in 1745 due to Indian hostilities. Silas was elected surveyor, 1748 and fence-viewer in 1750-1751 suggesting he was a trusted individual. Submit was born soon after her parents had moved from Rhode Island. She was actually born in Submit lived with her son John after her husband, Silas died. Three of her sons became doctors. Submit is said to have been very close to her children and grandchildren. In 1790 Submit Newcomb was head of a household in Mansfield, Conn. consisting of 5 females. iii. Anne Newcomb b. 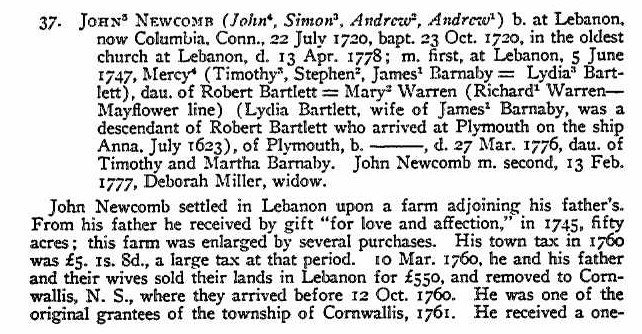 4 Mar 1720 in Lebanon, New London, CT; d. 1770; m, [__?__] Smith (1718-1788) They had Samuel and David named in their grandfather Newcomb’s will. v. Thomas Newcomb b. 3 Sep 1724 in Lebanon, New London, CT; d. 26 Aug 1753 Lebanon; m. 26 Mar 1751 in Lebanon to Anna Hibbard (b. 13 Aug 1734 in Canterbury, Windham, CT – d. 29 Dec 1759 in Canterbury) Anne’s parents were John Hibbard and Martha Durkee. Thomas and Anna had one child, Joseph born in 1752. After Thomas died, Anna married Francis Fenton. vi. Jerusha Newcomb b. 24 Mar 1726 in Lebanon, New London, CT; d. 25 Oct 1804 Burlington, CT; m. May 1745 in Canterbury, Windham, CT to Ezra Cleveland (b. 17 Apr 1726 in Canterbury – d. 7 Nov 1802 in Burlington) Ezra’s parents were Joseph Cleveland and Sarah Ainsworth. Jerusha and Ezra had twelve children born between 1748 and 1770 all in Canterbury, except the last in Tolland. vii. Elizabeth Newcomb b. 19 Dec 1727 in Lebanon, New London, CT; d. 31 Jul 1801 Canterbury, Windham, CT; m. 21 Apr 1747 in Norwich, CT to John Barstow (b. 31 Dec 1724 in Norwich, CT – d. 9 Feb 1796 in Canterbury) John’s parents were Job Barstow and Rebecca Bushnell. Alternatively, the were Joseph Barstow and Abigail Hydes. Elizabeth and John had ten children born between 1748 and 1767, the first in Norwich and the rest in Canterbury. ix. Jemima Newcomb b. 14 Dec 1730 in Lebanon, CT; d. 14 Aug 1769 or 19 Jun 1794 Thetford, Vermont; m1. 23 Nov 1749 to Jonathan Lamb (b. 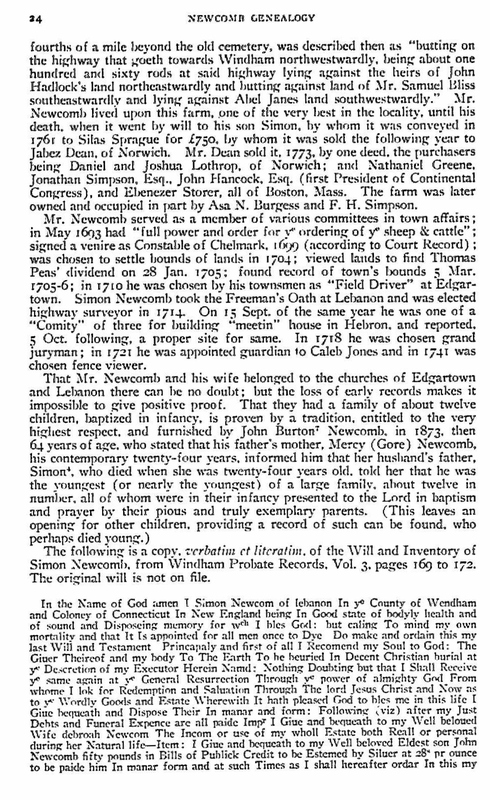 1735 in CT – d. 13 Nov 1754 in Norwich, CT) Jemima and Jonathan had two children born in 1751 and 1753.
m2. 12 Jun 1755 in Norwich, CT to Joseph Kinne (b. 17 Feb 1718 in Preston, CT – d. 15 Oct 1793 Thetford, Orange, Vermont) Joseph’s parents were Capt. Joseph Kinne (1680 – 1745) and Kesiah Peabody (1688 – 1717). Joseph first married 10 Jun 1740 in Preston, CT to Sarah Blunt (b. 29 Oct 1718 in Preston, New London, CT – d. 23 Dec 1754 Preston ) and had five children between 1743 and 1752. Jemima and Joseph had eleven children born between 1756 and 1773. On May 30, 1756, Joseph and Jemima were admitted to Preston Church, coming from East Norwich Church; the family was dismissed later when they removed to Vermont. He was Captain of the Preston Training Band. In 1761 he was appointed Lieutenant-Colonel of the 1st Company, Eighth Regiment Connecticut Militia in the French and Indian War. In 1763, he represented Preston in the General Assembly. 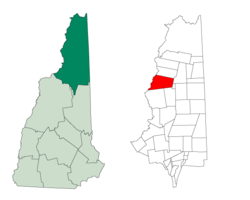 In 1781, Joseph deeded land at Cardigan, Vermont (now Orange, Grafton County, New Hampshire). Orange was granted in 1769 and incorporated in 1790. It was originally named Cardigan, after George Brudenell, fourth Earl of Cardigan. The Cardigan name lives on with Mount Cardigan and Cardigan State Park. After the Revolution, voters attempted to rename the town Bradford, Middletown, Liscomb, and finally Orange. The large quantities of yellow-orange ochre found in Mount Cardigan may have been the source of the name Orange. x. James Newcomb b. 7 Feb 1733 in Lebanon, New London, CT; d. 14 Dec 1799 Stephentown, Rensselaer, New York; m. 11 Sep 1755 in Lebanon to Submit Downer (b. 1725 in Norwich, New London, CT – d. 1820 in Mansfield, Tolland, CT) Submit’s parents were Samuel Downer and Phebe Bishop. Submit first married in Norwichl, CT to [__?__] Davis 1746 James and Submit had nine children born between 1756 and 1771 in Lebanon. 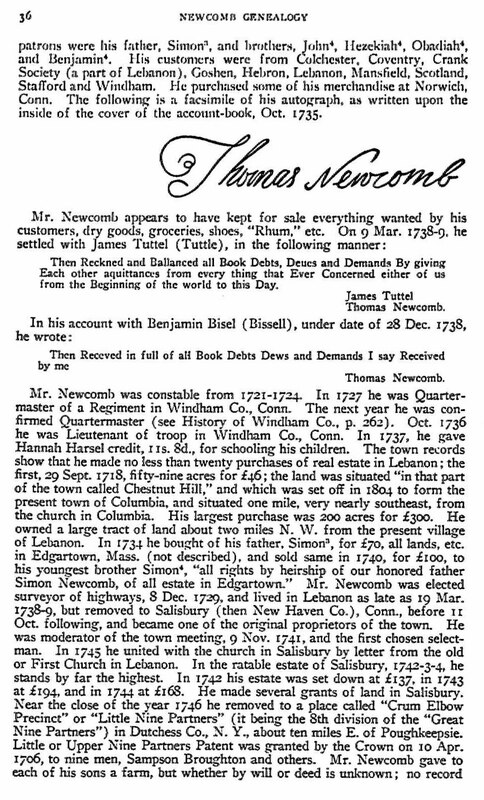 James resided with his father in Lebanon until the death of the latter in 1772, when he was one of the excutors of the will and received as his share of the estate “seventeen acres with the dwelling house.” James Newcomb was elected hayward (an officer having charge of hedges and fences around a town common, especially to keep cattle from breaking through and to impound stray cattle.) in 1766; surveyor of highways in 1774. While residing in Lebanon, he was said to have been the stoutest man ever born in that town. He removed to the state of New York; was residing in Little Hoosac, Albancy Co., in 1782; removed, 1785, to Stephentown, Rensselaer Co.
Obadiah’s first wife Abigail Curtis was born about 1693 in Andover, Tolland, CT. Her parents were Samuel Curtis (1649 – 1721) and Sarah Alexander. 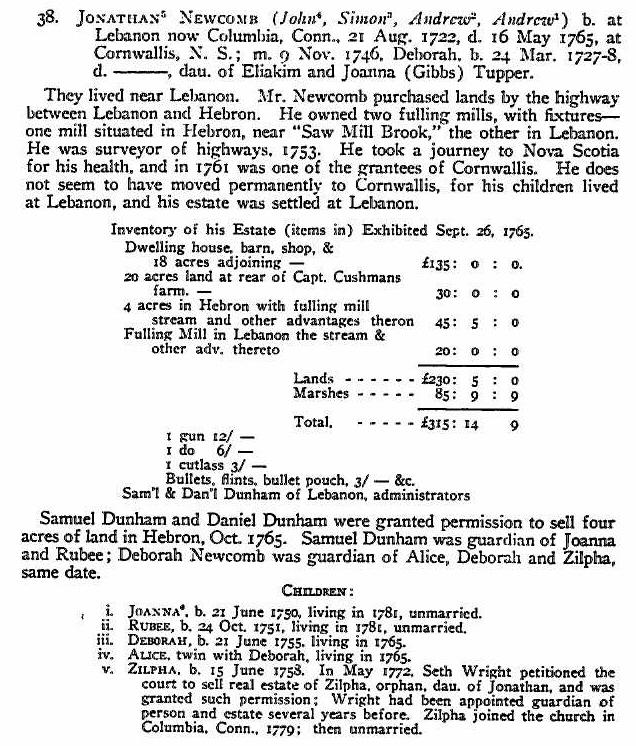 Abigail died 9 May 1757 in Hebron, CT.
Obaidah’s early manhood was spent in Edgartown, and in 1713 he removed to Lebanon, Conn., soon thereafter settling in the adjoining town of Hebron. He was engaged in the military service, hence the title “Capt.” upon his tomb, which is situated upon land which he formely owned, for generations known as the “Newcomb farm.” Assembly confirmed him Captain of the company or train band, in the parish of Andover, Conn., and requested that he be commissioned accordingly. The farm above referred to is in that part of Hebron, now Andover, about three-fourths of a mile from the railway station. The homestead was deeded to Obadiah Newcomb’s son Daniel as a gift, on July, 27, 1758, and consisted of 250 acres of fertile land. Capt. Newcomb invested in farm lands, and in 1718 purchased fifty acres of Joseph Bradford of New London, Conn. In 1726 he bought ten acres on “Village Hill” adjoining land of his brother Hezekiah. In 1738 he added seventy acres between “Ten Mile Brook and Hop River,” and in 1747 he invested in 100 acres in Shron, Conn. Like his forebearers, Capt. Obadiah Newcomb was an estimable man, a pious Christian, and from March 1727, a member of the Bolton Church. 21 Nov 1727 – A road was laid out to the southeast corner of Mr. Obadiah Newcomb’s orchard. In May 1743 Obadiah Newcomb’s name (with ohters) was signed to a petition of the residents of Hebron “praying there may be a district ecclesiastical society” there. Gives wife Mary 1/3 dwelling house during widowhood and 1/3 personal estate, not given to son. She and son Daniel Executors. To son Daniel, he gives land in Hebron and Coventry, and 2/3 farming tools, wearing apparel, gun, sword, and can, bonds, notes and book accounts “due me” (having already given him lands) he paying debts of estate and legacy to daughter. To daughter Abigail wife of David Barber 100 acres (land) in Sharon, bought of Joseph Owen; 1/3 personal estate and £50 “proclamation money” to be paid two years after decease by son Daniel. To daughter Jemima, wife of Seth Wales, two tracts of land in Cornwall 50 acres bought of Palmer, 200 acres bought of Wm. Turner and 1/3 personal estate. Provision made for Phinehas Ford who was indentured to Capt. Obadiah Newcomb. 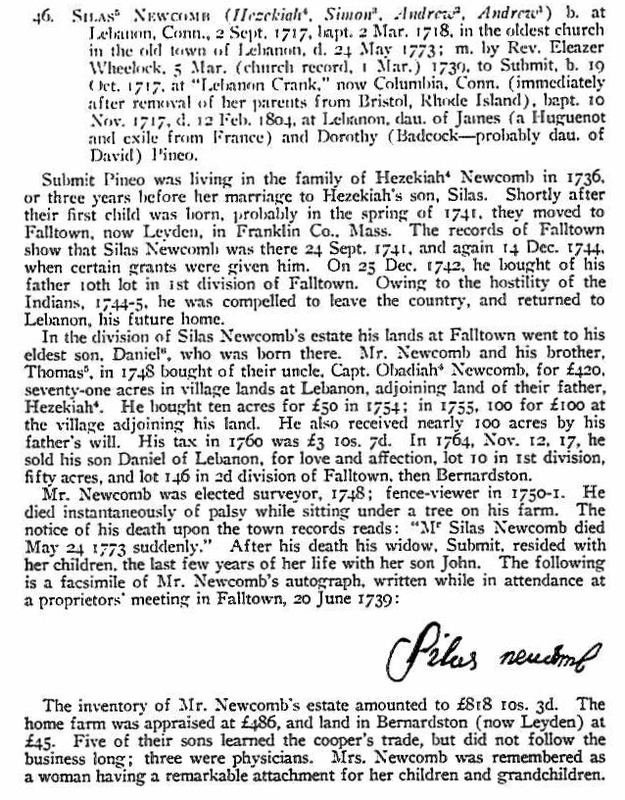 Only son, Daniel Newcomb, appeared and accepted trust, 6 July 1761.
i. Eunice Newcomb b. 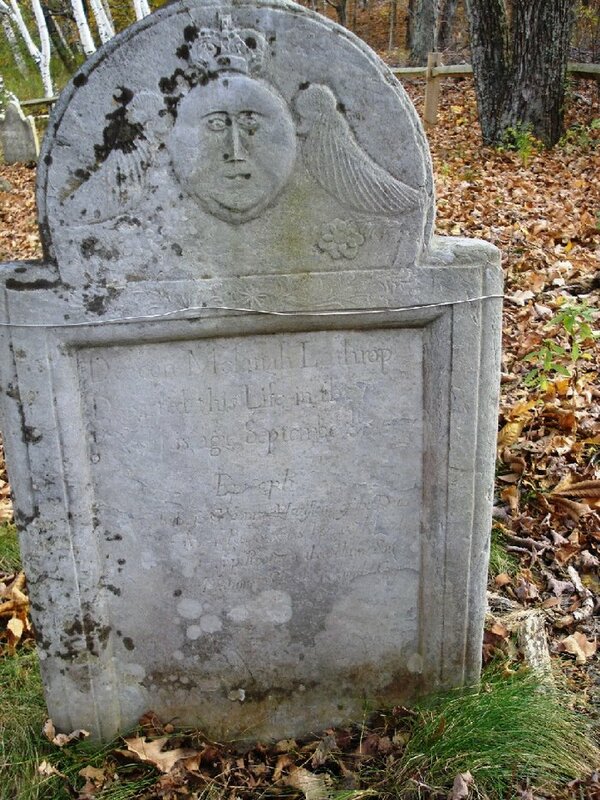 1725 in Hebron, Tolland, CT; d. May 1768; m. 27 Feb 1745 to Daniel Bliss. (b. 1723 in Hebron -d. 27 Feb 1765) Daniel’s parents were Rev. John Bliss (1690 – 1741) and Anne Terry (1691 – 1732) Eunice is not mentioned in her father’s 1758 will. Daniel had four children born between 1745 and 1765. There was a 14 year gap between Gillam (b. 1751) and Zenas (b. 1765). Maybe Eunice passed away before her father’s will and Zenas had a different mother. ii. Abigail Newcomb b. 1727 in Hebron, Tolland, CT; d. 22 Mar 1805 in Hebron; m1. 27 Feb 1745 Age: 18 Hebron to Aaron Horsford (b. 1720 in Edgartown, Dukes, Mass. – d. 24 Dec 1746 in Hebron); m2. 1749 Age 22 Hebron to Capt. David Barber (b. 17 Feb 1716 in Hebron – d. 14 Jan 1801 in Hebron) David’s parents were David Barber (1686 – 1729) and Hannah Post (1693 – 1759) David first married 8 Mar 1738 Age: 22 Hebron to Patience Case (1723 – 1748) and had five children between 1740 and 1748. Abigail and David had nine children born between 1749 and 1768. David was an inn‑keeper, and a well‑to‑do merchant in Hebron, but lost his fortune in the Revolution, when he held a wealth of continental currency, which became worthless. He was a Deputy to the Connecticut General Assembly 1769‑72. He also was a Captain in the Militia. David enlisted for 15 days in the Lexington Alarm, and also joined Capt. James Clark’s Company, 1775, to march to Boston, where they were at the Battle of Bunker Hill. Later he was stationed at Peekskill NY, and participated in the Battle of Saratoga. In 1778 he was appointed Captain in the 8th Company of the 1st Connecticut Regiment. He was a Justice of the Peace from 1777 on. iv. Daniel Newcomb b. 9 Nov 1729 in Hebron, Tolland, CT; d. 1789 Hebron; m. ~1754 Wethersfield, Hartford, CT to Elizabeth May (b. 3 Dec 1730 Wethersfield – d. 1789 Hebron) Elizabeth’s parents were Hezekiah May (1696 – 1783) and Anna Stillman (1699 – 1767). Daniel and Elizabeth had six children born between 1755 and 1767. His father’w will gave son Daniel land in Hebron and Coventry, and 2/3 farming tools, wearing apparel, gun, sword, and can, bonds, notes and book accounts “due me” (having already given him lands) he paying debts of estate and legacy to daughter. 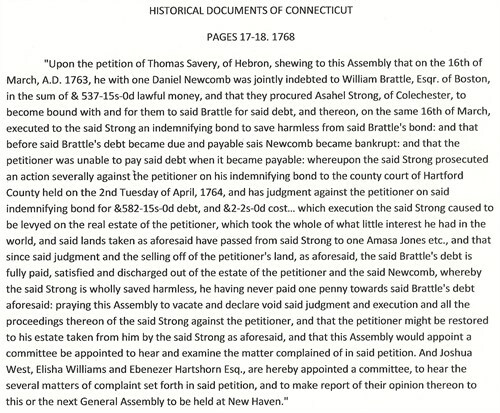 Petition mentioning Daniel Newcomb’s bankruptcy and one of his creditors. 24 April 1777 – Daniel enlisted for eight months as a Private in the Captain Sylvanus Brown’s company, Col John Chandler’s 8th Artillery Regiment. He is listed as being made an invalid. The 8th Connecticut Regiment also known as 17th Continental Regiment was raised on Sep 16, 1776 at Danbury, Connecticut. The regiment would see action in the Battle of Brandywine Sep 11 1777, Battle of Germantown Oct 4 1777 and the Battle of Monmouth Jun 28 1778. The regiment was merged into the 1st Connecticut Regiment on Jan 1 1781 at West Point, New York and disbanded on Nov 15 1783. Joseph Plumb Martin served in this regiment from 1776 until he was assigned Light Infantry in 1778. He would publish his memoirs about his experiences in 1830.
v. Jemima Newcomb b. 8 Dec 1730 in Hebron, Tolland, CT – d. 28 Dec 1786 in Leverett, Franklin, Mass; m. 12 Mar 1754 Hebron to Seth Wales (b. 2 Apr 1734 in Windham, Windham, CT – d. 28 Dec 1786 in Leverett) Seth’s parents were Ebenezer Wales (1696 – 1776) and Esther Smith (1702 – 1737). Jemima and Seth had eleven children born between 1754 and 1775. Her father’s will gave to daughter Jemima, wife of Seth Wales, two tracts of land in Cornwall 50 acres bought of Palmer, 200 acres bought of Wm. Turner and 1/3 personal estate. Columbia township was originally chartered in 1762 and named Preston, after Richard Graham, 1st Viscount Preston of Scotland. Settlers failed to meet the terms of the original grant, so the plantation was transferred in 1770 to grantees including Sir James Cockburn, 8th Baronet, after which it was named Cockburn Town, incorporated in 1797. In 1811, in the lead-up to the War of 1812, Governor John Langdon changed the name to Columbia. Although the surface is uneven and mountainous, the soil was of good quality. Maple sugar became an important product, and lumber was cut and transported on rafts down the Connecticut River to markets. From “The History of the Town of Amherst, Massachusetts,” by Carpenter & Morehouse, 1896, “Innkeepers in the earlier history of the town were —Seth Wales, 1779-80. —, Joseph Pettis, 1783-88.” And again, “in 1789____ & Joseph Pettis and Oliver Clapp were innkeepers.” Seth’s daughter Charlotte married Joseph Pettis, in 1782.
vi. Elizabeth Newcomb b. 1731 in Hebron, Tolland, CT; d. 7 Mar 1799 in Andover, Tolland, CT; m. Rev. Samuel Lockwood. This may be the Rev. Samuel Lockwood who was born 30 Nov 1721 at Norwalk, CT. He graduated from Yale in 1745 and married Anne May after he settled in Andover. However, Elizabeth Newcomb may have been a first wife. Deborah’s husband Captain Timothy Hatch was born 19 Oct 1695 in Falmouth, Barnstable, Mass. His parents were Benjamin Hatch and Elizabeth Eddy. 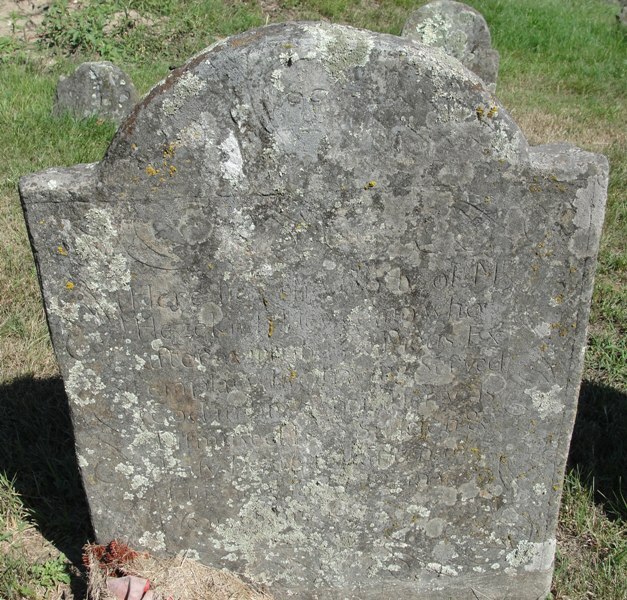 Timothy died 30 Mar 1766 in Kent, Litchfield, CT.
Timothy Hatch moved to Tolland when a young man and purchased land in 1721. They settled at Tolland, Conn., where their children were born. May 14 1739, he, of Tolland, bought, for £300, land in Kent, Conn., to which place he removed. On May 12 1743 he was commissioned Captain of the Train Band. He and his wife were received into the church at Kent Jun 28 1741, and he was appointed the first deacon on the 31st of July of the same year. Captain Hatch laid out the town of Kent and was and influential citizen. He owned considerable land in the vicinity and served as a justice of the peace. i. Sylvanus Hatch (b.11 Jul 1717 Bridgeport, Fairfield, CT – d. 1785 Kent, Litchfield, CT; m. 14 Apr 1743 in Kent to Mehitabel Hubbell (Mehitable Hubble) (b. 1726 in Bridgeport) Mehitable’s parents were Ephraim Hubbell and Abigail Bradley. 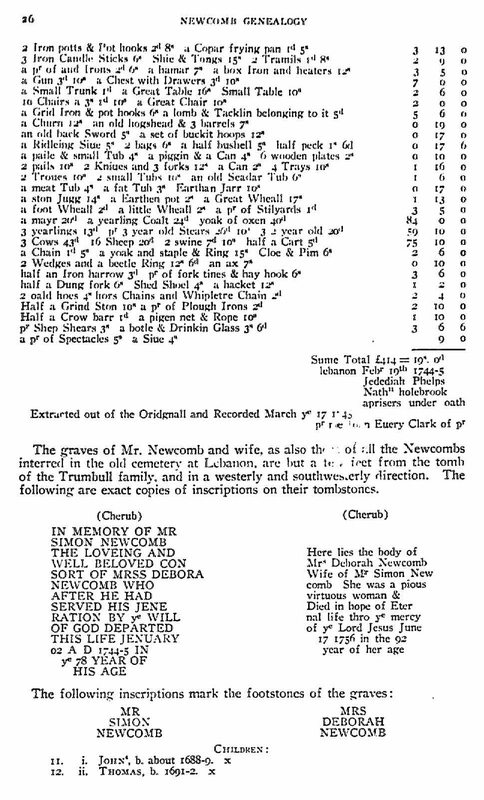 Sylvanus and Mehitable had thirteen children born between 1743 and 1765 in Kent, CT.
ii. Mary “Mercy”? Hatch b. 17 Aug 1718 Lebanon, New London, CT; d. 16 Oct 1788 Columbia, New York; m. 15 Nov 1738 in Tolland, Windham, CT to Melatiah Lathrop (b. 20 Feb 1714 in Falmouth, Barnstable, Mass. – d. 5 Sep 1787 in Canaan, Columbia, NY’ ) Melatiah’s parents were cousins Capt. Hope Lathrop (1671 – 1734) and Elizabeth Lathrop (1677 – 1763). Mary and Melatiah had sixteen children born between 1739 and 1766. They removed 1757 to Amenia, Dutchess Co, NY where he was an early settler in the southeast part of that town and Deacon of the Presbyterian Church at Oblong. Melatiah Lathrop and 5 of his sons were in the Revolutionary War in the 17th New York Regiment of Militia He was a private in Capt. Ebenezer Cady’s Company, Col. William Whiting’s Regiment, of Albany County Militia. iv. Jethro Hatch b. 17 Sep 1722 Tolland, Tolland, CT; d. 29 Sep 1818 Kent, Litchfield, CT; m. 5 Nov 1747 in Lebanon to Martha Clark (b. 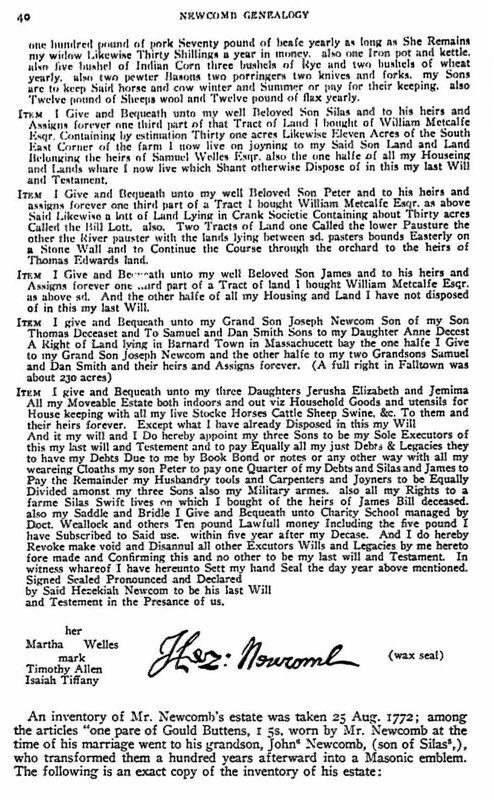 2 Feb 1723 in Lebanon – d. 15 Jul 1815 in Kent) Martha’s parents were our ancestors William CLARK Jr. and Bethiah WILLIAMS. Jethro and Martha had eight children born between 1750 and 1767. Jethro was a Revolutionary War Soldier; died at age 96. The 2nd Continental Light Dragoons, also known as Sheldon’s Horse after Colonel Elisha Sheldon, was commissioned by the Continental Congress on Dec 12, 1776 and was first mustered at Wethersfield, Connecticut in Ma 1777 for service with the Continental Army. The regiment consisted of four troops from Connecticut, one troop each largely from Massachusetts and New Jersey, and two companies of light infantry. The regiment saw action at the Battle of Woodbridge, Battle of Brandywine, Battle of Kingston, Battle of Schoharie, The Battle of The Flocky (site of the first cavalry charge on American soil), Battle of Paoli, Battle of Whitemarsh, Battle of Morrisania, Battle of Saratoga, Battle of Germantown, and the Battle of Yorktown. The unit almost never served as a whole. Usually individual troops were assigned as necessary. The regiment also performed numerous raids from whaleboats against British and Loyalist installations on Long Island. Some of the successful raids captured Fort St. George, Ft. Slongo and Lloyd’s Neck, Long Island. Elements from the unit comprised Washington’s personal bodyguard. In 1778, when Loyalist agents and a crack British commando team shadowed Washington for weeks with the intention of kidnapping him, they had to abandon the operation because, according to the British Intelligence Dispatches, “The 2nd Dragoons are (always) with him.” The 2nd Dragoons also guarded John Andre during his incarceration, trial and subsequent execution in Nyack, New York. The regiments main patrol areas during the war were in Southern Connecticut and New York, where they intercepted British supplies and fought off bands of Loyalist partisans who preyed on local citizens. This duty earned them the nickname “Watchdogs of the Highlands”. They also earned the sobriquet “Washington’s Eyes”, likely because of their spy work. Major Benjamin Tallmadge became a spy master who ran one of the most successful spy rings of the war, able to infiltrate the British military command in New York city. viii. Job Hatch b. 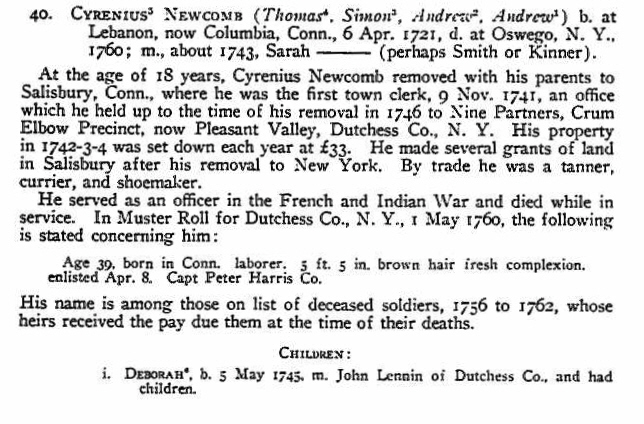 10 May 1731 Lebanon, New London, CT Several genealogies say that Job died in Young, Texas, but I don’t think that would have been possible that early. They probably copied that he died young. Sarah’s husband Ebenezer Nye was born in 1692 in Sandwich, Barnstable, Mass. His parents were Caleb Nye and Elizabeth Atwood. He first married Susanna Delano who died 20 Jan 1718. 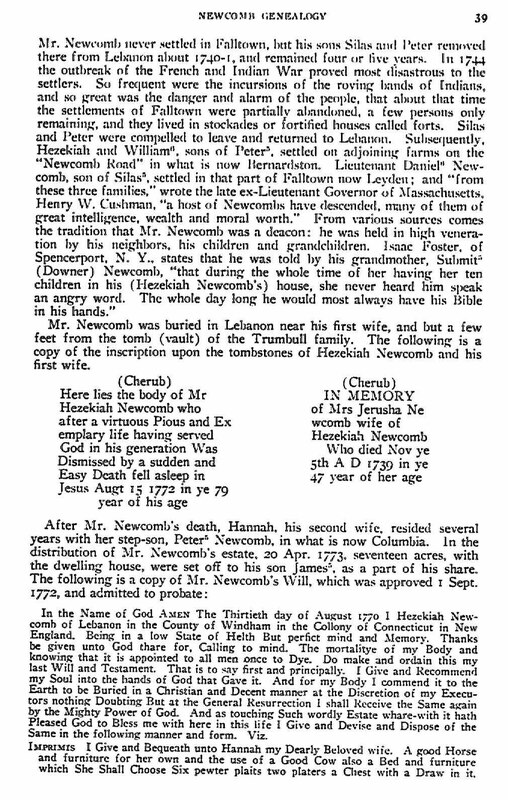 He married (2d) January 13, 1719-20, Sarah, daughter of Simeon and Deborah Newcomb. 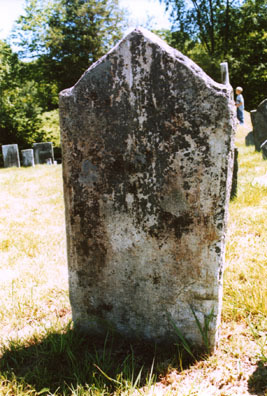 Ebenezer died 2 Jul 1759 in Tolland, Tolland, Connecticut. Father to thirteen children: (by Susanna) Susanna; (by Sarah) John, Sarah, Ebenezer, Elizabeth, Benjamin, Eunice, Lois, Silas, Mallitiah, Thankful, Samuel, and Sarah Nye. Ebenezer was at Tolland, Connecticut as early as 1718, and was for forty years one of the leading citizens of that town. His farm was in the eastern part of that town lying on the Willimantic River at a point known as Nye’s Bridge. He was clerk of the military company in 1722. Ensign, May 1736; Lieutenant, May 1737; Captain, October 1751. He was Surveyor for many years. Ebenezer was a Selectman for thirteen years, and Representative in 1753. Ebenezer’s son Samuel enlisted in the 2nd Connecticut Regiment,. Colonel Swift August 7, 1781 and was discharged Dec 13, 1781.
i. Elizabeth Nye b. 14 Dec 1720 in Tolland, Tolland, CT; d. 14 May 1749 Mansfield, Tolland, CT; m. 10 Nov 1743 in Mansfield to Seth Pierce (b. 30 Nov 1716 in Woburn, Middlesex, Mass. – d. 5 Dec 1794 in Mansfield) Seth’s parents were Samuel Pierce and Abigail Johnson. ii. John Nye b. 7 Nov 1722 in Sandwich, Barnstable, Mass. m. 8 Jun 1749 in Wilmington, CT to Abigail Fuller (b. 23 Feb 1730 in Sandwich – d. 8 Jun 1749 in Wilmington) Abigail’s brother Daniel married John’s sister Lois. Their parents were Daniel Fuller and Lucy Goodrich. John and Abigail had six children between 1752 and 1762.
iv. Benjamin Nye b. 13 May 1728 in Tolland, Hartford, CT; d. 1818 Willington, Tolland, CT; m1. 12 Jun 1755 in Tolland, Tolland, CT to Phebe West (b. 2 Sep 1735 in Tolland – d. 4 May 1769 in Middlebury, Addison, Vermont) Phebe’s brother Oliver married Benjamin’s sister Thankful. Their parents were Amasa West and Amy Hatch. Benjamin and Phebe had six children born between 1752 and 1762.
vi. Lois Nye b. 25 May 1732 in Tolland, Tolland, CT; m. 19 Jul 1755 in Willington, CT to Daniel Fuller (b. 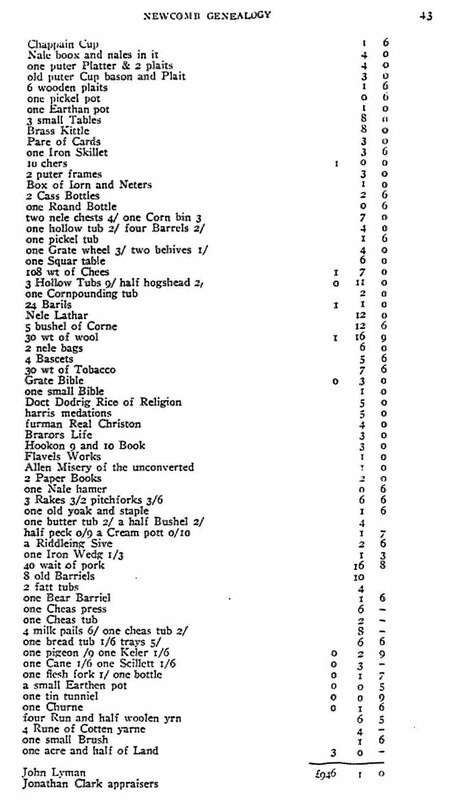 12 Mar 1732 in Willington, Mass. – d. 1790) Daniel’s sister Abigail married Lois’ brother John. Their parents were Daniel Fuller and Lucy Goodrich. vii. Meletiah Nye b. 21 Apr 1734 in Tolland, CT; d. 4 Aug 1794 Glastonbury, CT; m. 8 Mar 1757 in Glastenbury, Hartford, CT to Nancy Hubbard (b. 1738 in Glastenbury, Hartford, CT) Nancy’s parents were David Hubbard and Prudence Goodrich. viii. Thankful Nye b. 2 Aug 1736 in Tolland, CT; d. 13 Mar 1806 Lee, Berkshire, Mass. ; m. 20 Jan 1757 in Tolland, CT to Oliver West (b. 2 Oct 1733 in Tolland, Tolland, CT – d. 23 Apr 1816 in Lee ) Oliver’s sister Phebe married Thankful’s brother Benjamin. Oliver’s parents were Amasa West and Amy Hatch. Thankful and Oliver had eight children between 1758 and 1775.
ix. Samuel Nye b. 20 Jul 1738 in Tolland, Tolland, CT; d. 8 May 1781 Tolland, Tolland, CT;m. 20 May 1765 in Tolland, Tolland, CT to Abigail Benton (b. 1740 in Tolland, Tolland, CT – d. 1 Mar 1782 in Tolland, Tolland, CT) Samuel and Abigail had seven children between 1766 and 1779.
x. Silas Nye b. 21 Aug 1740 in Sandwich, Barnstable, Mass. xi. Sarah Nye b. 25 May 1743 in Tolland, Tolland, CT; d. 22 Oct 1817 Tolland, Tolland, CT; m. 22 Nov 1764 in Tolland, Tolland, CT to Rufus West (b. 1 Oct 1735 in Tolland, Tolland, CT – d. 12 Aug 1814 in Tolland, Tolland, CT) Rufus’ parents were Joseph West and Joanna Delano. Elizabeth’s husband Ebenezer Wright was born 22 Feb 1701, at Lebanon, (Conn); His parents were Abel Wright and Rebecca [__?__]. Elizabeth bore him three children, and died 13 Jan 1727. He married second, 28 Mar 1728, Sarah Huntington, b. May 25, 1705, dau. of Joseph Huntington and Rebecca Adgate, and sister to Gov. Samuel Huntington (Wiki)’s father, by whom eight children, when she died Oct. 19, 1775. He married third, Feb. 13, 1776, Mrs. Mary (Mason) Huntington, the widow of David Huntington, a brother of his wife Sarah, with whom he lived ten years, and died April 22, 1786, at Mansfield, (Conn.), aged 85. Samuel Huntington (1731 -1796) was technically the first president of the United States. He was a jurist, statesman, and Patriot in the American Revolution from Connecticut. As a delegate to the Continental Congress, he signed the Declaration of Independence and the Articles of Confederation. He also served as President of the Continental Congress from 1779 to 1781, chief justice of the Connecticut Supreme Court from 1784 to 1785, and the 18th Governor of Connecticut from 1786 until his death. ii. Deborah Wright b. 29 Jan 1725 in Windham, Windham, CT; m. 7 May 1747 in Mansfield, CT to Paul Davison (b. 5 Apr 1711 in Mansfield, CT – d. 20 Aug 1751 in Newton, New Jersey) Paul’s parents were Peter Davison and Ann Morgan. Paul first married 30 Aug 1733 in Mansfield, Tolland, CT to Abigail Phelps (b. 12 Mar 1712 in Mansfield, Tolland, CT – d. 7 May 1747 in Mansfield, Tolland, CT) and had three children. Deborah and Paul had three more children. iii. Ebenezer Wright b. 2 Jan 1727 in Windham, CT; d. 18 Jul 1809 Cornwall, Canada; m. 11 Mar 1751 in New Fairfield, CT to Mercy Leach (b. 12 Nov 1733 in Windham, CT – d. 13 May 1801 in Cornwall, Ontario, Canada) Mercy’s parents were Amos Leach and Mercy Martin. Ebenezer and Mercy had eleven children born between 1752 and 1776. Ebenezer was a farmer, lived in Mansfield, (Conn.) a few years, then in New Fairfield, Conn., then in Newtown, Sussex Co., N.J., and about 1765-6 removed to Shaftsbury, VT. The events of the War of the Revolution sent him to Canada West, where he spent the evening of his life, with his companion and five children near him, at Cornwall and Johnstown. Simon’s first wife Hannah Carter was born 1707 in Eastham, Barnstable, Mass. Simon’s second wife Jerusha Lathrop was born Jul 1706 in Edgartown, Dukes, Mass. Her parents were Thomas Lathrop and Mehitable Sarson. Jerusha died 13 Apr 1748 in Lebanon, New London, CT.
Simon’s third wife Jane Lathrop was born 8 Sep 1687 in Edgartown, Dukes, Mass. Her parents were Thomas Lathrop and Mehitable Sarson. 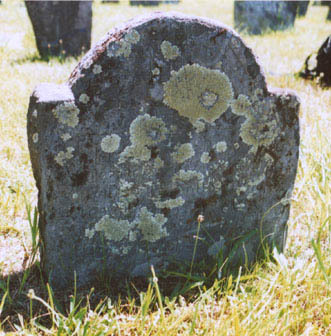 Jane died after 1770 in Cornwallis, Kings, Nova Scotia, Canada. When, in 1755, under orders of the General Assembly a total force of 3000 men was raised in Connecticut, the payroll of Capt. John Terry’s Company, which marched from Lebanon 15 Sept., included “Simon Newcomb, master”, signing for Stephen. Harding Williams, Private, who served from Aug. 29 to Dec. 9, 1755. This signature seems to show that Williams was the bound servant of Simon Newcomb. Simon Newcomb served two weeks (as long as any) in Lieutenant-Colonel David Whitney’s company of militia for the relief of Fort William Henry, Aug. 1757. All of his company were Canaan men. Simon Newcomb, 28 July 1740, bought of his brother, Thomas, for £100, “all Rights by Heirship of my Honored father Simon Newcomb of all estate in Edgartown,” Mass., the same which Thomas bought of their father in 1734. 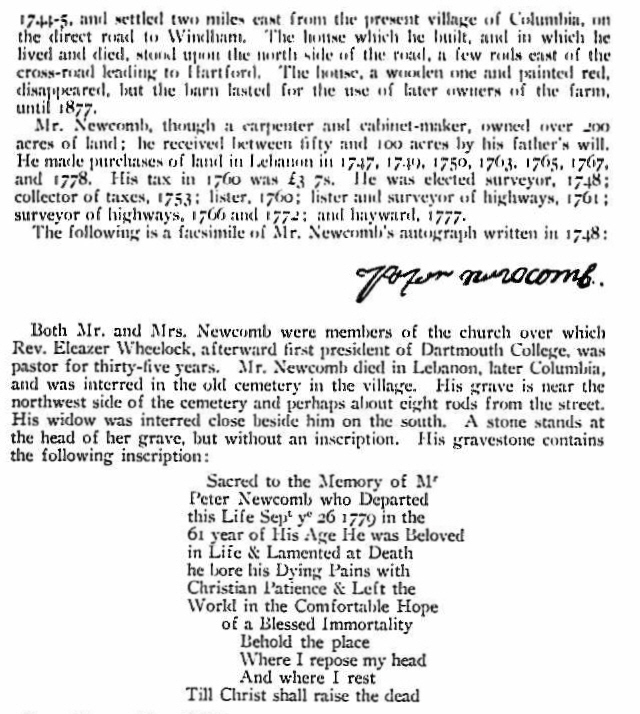 Mr. Newcomb resided upon his father’s farm, which he inherited by will (after paying certain legacies) and which he came into full possession of upon the death of his mother in 1756. 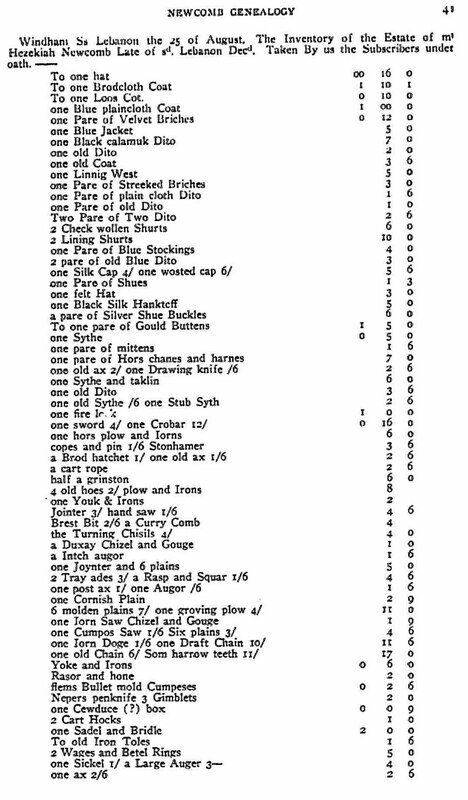 In 1760 Mr. Newcomb’s tax was £4 3s 4d, a large tax for that period. On 15 May 1761, he sold the farm to Silas Sprague for £750. Mr. Newcomb was chosen by his townsmen for several positions of trust; for example, surveyor of highways and fence viewer, and was a man of prominence in his community. Simon moved with his family and brothers John and BENJAMIN to Cornwallis with his parents in 1761. Daughter Jerusha was born in Martha’s Vineyard and later went to Lebanon, CT with her family. The family lived in Lebanon where Simon lived on his father’s farm, which he inherited upon the death of his mother in 1756. He left Lebanon with about 60 other families from Lebanon for Nova Scotia, many to Cornwallis. There Jerusha married neighbor Archelaus Hammond in the first marriage of the Planters recorded in Kings County. They lived at New Horton New Brunswick. ii. Jerusha Newcomb b. 2 Jan 1744 in Lebanon, New London, CT; d. 1834 New Brunswick; m. 1762 in the first marriage of the Planters recorded in Kings County Nova Scotia to neighbor Capt. Archelaus Hammond (b. 1736 in Fairhaven, Mass. – d. 1805) Archelaus’s parents were Archelaus Hammond Sr. and Elizabeth Weeks. Jerusha and Archelaus had five children born between 1762 and 1771.
aaa. Simon Newcomb (wiki) (1835 – 1909) was a Canadian-American astronomer and mathematician. Though he had little conventional schooling, he made important contributions to timekeeping as well as writing on economics and statistics and authoring a science fiction novel. July 11, 1909 (aged 74) Washington D.C.
Simon Newcomb was born in the town of Wallace, Nova Scotia. His parents were Emily Prince, the daughter of a New Brunswick magistrate, and itinerant school teacher John Burton Newcomb. John moved around teaching in different parts of Canada, particularly in different villages in Nova Scotia and Prince Edward Island. Newcomb seems to have had little conventional schooling other than from his father and from a short apprenticeship to Dr. Foshay, a charlatan herbalist, in New Brunswick in 1851. Nevertheless, his father provided him with an excellent foundation for his future studies. Newcomb’s apprenticeship with Dr. Foshay occurred when he was only 16. They entered an agreement that Newcomb would serve a five-year apprenticeship during which time Foshay would train him in using herbs to treat illnesses. For two years he was an apprentice but became increasingly unhappy and disillusioned with his apprenticeship and about Foshay’s unscientific approach, realizing that the man was a charlatan. He made the decision to walk out on Foshay and break their agreement. He walked the 120 miles to the port of Calais in Maine where he met the captain of a ship who agreed to take him to Salem, Massachusetts so that he could join his father. In about 1854, he joined his father in Salem (John Newcomb had moved earlier to the United States), and the two journeyed together to Maryland. After arriving in Maryland, Newcomb taught for two years from 1854 to 1856; for the first year in a country school in Massey’s Cross Roads, Kent County, then for a year at a school not far south in Sudlersville. In his spare time he studied a variety of subjects such as political economy and religion, but his deepest studies were made in mathematics and astronomy. In particular he read Newton’s Principia at this time. In 1856 he took up a position as a private tutor close to Washington and he often travelled to that city to study mathematics in the libraries there. He was able to borrow a copy of Bowditch’s translation of Laplace’s Traité de mécanique célestefrom the library of the Smithsonian Institution but found that the mathematics which the book contained was rather beyond his current knowledge. Newcomb studied mathematics and physics privately and supported himself with some school-teaching before becoming a human computer (a functionary in charge of calculations) at the Nautical Almanac Office in Cambridge, Massachusetts in 1857. At around the same time, he enrolled at the Lawrence Scientific School of Harvard University, graduating BS in 1858.
vi. Mary “Molly” Newcomb b. 1 Mar 1752 in Lebanon, New London, CT; d. 3 Dec 1797 Nova Scotia; m. 26 Jan 1769 in Cornwallis, Kings, Nova Scotia, Canada to Moses Gore (b. 2 May 1744 in Norwich, New London, CT – d. 1797) Moses’ parents were Moses Gore Sr. and Desire Burris. Mary and Moses had five children born between 1770 and 1782. This entry was posted in -9th Generation, Line - Miller, Public Office and tagged Martha's Vineyard, Professor Simon Newcomb (1835-1909). Bookmark the permalink.